If you clearly understand test vocabulary—especially writing test prompts (instructions), you can earn a much higher score. Read the essay on Sharing Ideas for an explanation and demonstration of verbs that are frequently used in writing prompts. Then check your understanding with the quiz below. We have many different words for sharing information. We may want to explain an idea or a process—to make it clear to someone else. 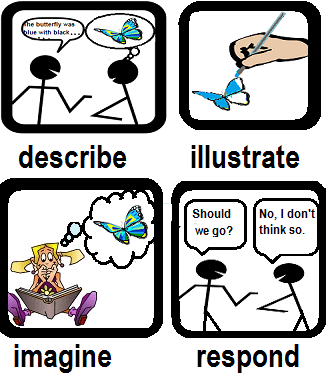 Sometimes we will use examples or pictures to illustrate our point, or even demonstrate (show) it in action. If we see (or hear or feel) something beautiful or unusual, we will want to describe it to our friends so they can imagine what we experienced. We may tell a story, either to amuse or excite our friends or to persuade someone to take action or change their thinking. We may want to identify (find and name) the causes of a problem, or its possible solutions. We also respond to the stories and arguments of others. We determine (figure out or decide) exactly what they mean and whether we agree or disagree. We might discuss the advantages and disadvantages of an idea or decision and try to persuade them that our solution is better. We might even interpret their ideas to our friends, expressing them in language that makes more sense to us, or integrate their ideas with some of our own. People write for many of the same reasons they speak: to explain, to describe, to entertain, to compare and contrast ideas or situations, to persuade, or to agree, disagree, or add to what others have written. However, there are some important differences between talking to a friend and writing an essay or a report for school, work, or an audience of strangers. Essays should be planned and written much more carefully than informal conversation between friends. Writers need to develop their ideas clearly, in a well-organized way that is easy for readers to follow. Because of shared experiences, our friends can guess at meaning even when when we don't explain them well. Strangers might completely misunderstand our intention if our explanations are unclear. and a conclusion that summarizes the main points. Authors choose their words carefully, often using ‘academic language’ that may be more accurate (exact) than ordinary speech. They need to avoid slang and even contractions, to revise what they have written to express their meaning as accurately as possible, and then to revise and proofread it. Writing well is a lot of work! Authors find it worthwhile if they can entertain, persuade, or share their thoughts and feelings with people they may never meet. If you would like another chance to see these and other academic words in use before taking the quiz, see Essay Organization or "Unintended Consequences" on Proofreading Practice. If not, see how well you understand their use with the vocabulary check below. Choose the best answer to each question, then press the right arrow to move to the next question. > English Language Test Preparation> Writing Test Vocabulary.